Description : This elegant wallet made of the hand finished Italian Tamponato is ideal for the inside pocket of your jacket. It has a note compartment and two side pockets. On the RHS there is a zip pocket for coins. On top of this coin pocket is a slot for keeping some notes. 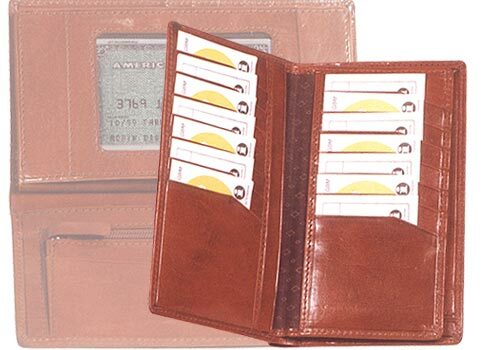 The LHS has a flap that has a net window for a driving license or a photograph of your family. Beneath the flap there are fourteen credit slots and two side pockets of size 15.5 x 7.8 cm and one pocket of 9 x 15.5 cm.